Now on to some old school Sony....the XM series. 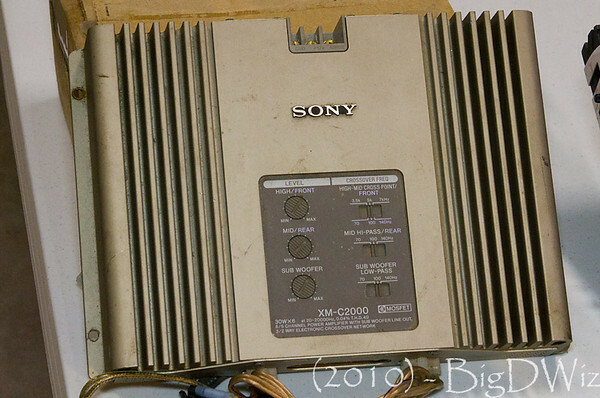 This one in particular is the XM-C2000, which is a rare, 6 x 30 amp from Sony. I got this from a buddy of mine back in the mid-1990's. He had it powering a system in his Corolla GTS and I couldn't believe it when he told me they used a Sony amp until I got in his car to hear the system. WOW, Sony made amps that ROCKED? Yessiree, they did back in the early to mid-1990's. I can tell you the two rear 30 watt channels powering (2) 10" subs in a bandpass box nearly blew me away. Not only was it LOUD, but sounded VERY clean. He had 5.25 separates in the doors and 5.25 coaxes in the rear, each powered by their own 30x2 channels. I used the amp in my Ford Ranger for a few years powering (2) 10" MTX Blue Thunder subs and 5x7 coaxes in the doors (yeah, I know, 5x7's, call me lazy). I took the XM-C2000 out about a year ago when I thought I was going to sell my truck....well, I still have the truck and I still have the amp (no 10" Blue Thunder's though, sold them). Maybe I'll put this amp back to use one day soon....if not, I won't be getting rid of it anytime soon. ".... I REALLY BADLY want this amp!!! I collect o/s Sony. I have a few matching mid-late 80s amps, one from the 90s, and for home audio...a pair of 1976 SSU-1800s. All of those but the 90s amp are super rare, and all sound amazing." i got that amp- how much u trying to pay? ?